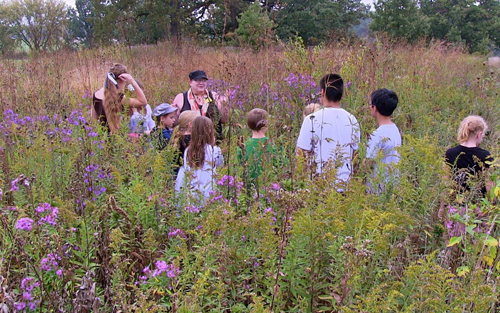 Garfield Farm Museum offers guided walks of its prairie and woodland areas from springtime through the autumn, lead by Jerome Johnson, the museum’s biologist; John Engstrom, Natural Areas Manager; or other plant experts. Museum areas include prairie and sedge meadow along Mill Creek, oak savanna, and the Harley Pond emphemeral wetland. Walks like this are especially good to begin one's familiarity with a specific ecosystem. Instead of being overwhelmed by dense vegetation in various states of bloom, the first spring walk highlights features like the lay of the land, the massive size and heights of trees, a chance to see wildlife without leaf covered shrubs. The many noticeable pools of water in farmer's fields reflect the fact that much of Illinois prairies were seasonally wet. Only with the advent of tiling fields after the Civil War, did wet areas that had not been broken in the first 30-40 years of settlement, finally fall to sharp ploughshares. With the start of summer, the look of the prairie is beginning to change with all the new growth that has emerged in the wake of March and April’s prairie burns. With the full arrival of summer, the native plants of Northern Illinois begin to express their lush, robust growth. With a good moisture regime through the summer, many of the tallest plants may reach their maximum heights before summer's end. Each February natural area experts conduct a daylong serminar covering key methods and techniques of preserving and using the best adapted plants for the Illinois environment. The day’s outline will consist of researching property history, identifying native plants, identifying invasive species and the use of fire, herbicides, cutting and brush stacking equipment. Special topics include using native species with ornamental plants and the use of native trees and shrubs in home landscaping. With the extreme ranges in weather over the last dozen years, only native plants have the genetic ability to deal with such fluctuations. Deep roots, delayed germination or growth, drought and flood tolerance, can be just some of the defenses against an uncertain environment. This is where the 100 years plus collective experiences of the seminar’s speakers will help guide property owners in selecting plants that are genetically programmed to withstand climatic extremes. For more information about Garfield Farm send an e-mail message to: info@garfieldfarm.org or call 630/584-8485.